Living LIGO: Q: What Was/Will Be the Detection Range of Initial/Advanced LIGO? Q: What Was/Will Be the Detection Range of Initial/Advanced LIGO? REMINDER: I DO NOT speak for the LIGO Scientific Collaboration or the Virgo Collaboration. Therefore, these answers are mine alone as are any mistakes. What's the effective range for LIGO? and for adv LIGO? Will it include Virgo Cluster? The answer to this includes calibrations (which are fundamental to any experiment), astronomy, and General Relativity (I promise, no math). First let's talk about calibration. Any time you do an experiment, you use an instrument to measure something and before you can make statements with any confidence about your result, you need to know exactly how your instrument responds or works. For LIGO, that means we need to understand how the light at the output of LIGO (where the interference pattern between the arms and gravitational waves are observed) changes when the mirror moves a known amount. This is a bit more complicated than it sounds since there are feedback systems in LIGO that serve to keep the mirrors still (mostly to cancel vibrations of the mirror from our environment). 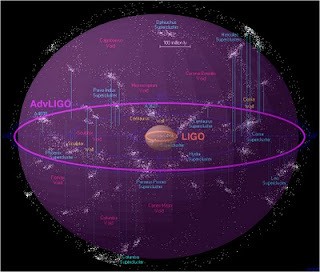 There are measurements that are made at the beginning and the end of each science data run that are used as reference characterizations of these feedback systems and there are measurements of small vibrations with a specific frequency that are purposefully and continually applied to the mirrors to characterize the calibration of LIGO at a given time. (These calibration vibrations only affect our ability to detect gravitational waves at that specific frequency.) Together, this information allows us to convert the intensity of the interference pattern LIGO produces into the change in length of LIGO's arms (which is what a passing gravitational wave will induce). burst gravitational waves (these are short gravitational waves from previously unknown sources or sources that are not well modeled - like what happens inside a star as it collapses right before the bright burst of light from a supernova). The gravitational wave should be from a source we theoretically know very much about. That is, a simple system that produces a well characterized gravitational wave. The gravitational wave source should be abundant in the near Universe so that we can reasonably expect to detect it as one of the first direct gravitational wave measurements. From these priorities the binary inspiral mergers stand out since bursts are inherently unknown, stochastic gravitational waves are inherently weak and the population of sources that produce continuous gravitational wave is not well established. Now that we have settled on a source, we want to use a pair that is representative of the source but not exceptional in strength (otherwise, we would be overestimating how far out into space we can realistically expect to detect these gravitational waves). LIGO chose a 1.4 solar mass neutron star paired with another 1.4 solar mass neutron star (FYI: 1.4 solar masses is on the lower limit of the expected mass of a neutron star so LIGO picked a very conservative measure for our detection distance measure). Since General Relativity tells us how strong a gravitational wave this source will produce with respect to how far away the source is, we can combine this with our calibration (or current sensitivity) of LIGO to establish how far into the Universe we can expect to detect this representative gravitational wave. The green line represents the detection range for the LIGO here in Livingston, Louisiana (known to us as L1) and the red line is other range of the LIGO detector in Hanford, Washington (known to us as H1). The horizontal axis shows what time the measurement was taken (going back in time moving from right to left; the far right [Time = 0] was when this plot was produced) and the vertical axis measures the distance into space in Mpc (megaparsecs). Parsecs are a somewhat odd unit of distance to anyone who doesn't study astronomy but it is equal to about 3.26 light years. During the last data run with LIGO before the advanced LIGO upgrades began, you can see from the plot above that we were able to detect our neutron star pair out to about 20 Mpc or 65 million light years. This did indeed encompass the Virgo Cluster of galaxies (which are between 53.5 and 54.1 million light years away). However, LIGO was not able to maintain this detection distance all the time (you can see on the plot above that starting at about -1.5 hours the L1 range dropped from about 20 Mpc to about 15 Mpc - this was due to increased seismic activity in the region that was beyond our control). Since the Virgo cluster is located at about 16.5 Mpc, you can see that it was not always within our detection range. Each dot in this illustration is an entire galaxy, not just a star! It is also important to consider the limitations of this detection distance since we are limiting ourselves to thinking about only one particular kind of gravitational wave. For example, I specialize in searching for burst gravitational waves. These were not chosen as our standard candle because we don't know much about them (we like to call them the gravitational waves that go bump in the night). But to apply the detection distance measured in our figure-of-merit based on a different class of gravitational waves would be short-sighted since bursts could very well be stronger (gamma ray bursts are some of the most energetic light signals astronomers have observed and, not only do we not know what causes them, many of them are VERY far away). When we use a catalog of galaxies to target our burst searches (after all, a gravitational wave is much more likely to come from an area on the sky containing a galaxy unless we lucked out and had a nearby gravitational wave from our own galaxy), we include all known galaxies up to about 2.5 times the standard candle detection range (about 50 Mpc, or about 163 million light years). I hope this answered this questions satisfactorily! I know this is a bit long, but I wanted to be thorough and explain as much jargon as possible. If you have questions about this or anything else, feel free to ask in a comment below or send it to me on Twitter @livingligo!